More than 700 operatives have completed the Basic Competency Programme (BCP) since its launch in 2015. As one of the most significant improvements in training, the BCP provides exposure to further training to National Vocational Qualification (NVQ) level – yet the LRWA has found that less than 100 of these trainees have gone on to collect a red, ‘Experienced Worker’ CSCS card. We all know the BCP acknowledges the contribution of manufacturers towards providing a skills base through training in the use of their materials, which satisfies the requirements of the red, ‘Experienced Worker’ CSCS card. The red card, which is valid for three years, cannot be renewed after this time, as operatives are encouraged to enrol for and complete an NVQ L2, which allows them to gain a blue, CSCS ‘Skilled Worker’ card. The LRWA is keen to raise awareness of the importance of completing full training in liquid waterproofing to NVQ L2, which can begin with the BCP. Chris Bussens, training coordinator at the LRWA, said: “In the last four years, 120 operatives registered onto a NVQ L2 Diploma in Liquid Waterproofing, delivered through CITB, with 87 achieving their qualification so far. “Yet, the LRWA has seen a breakdown in the continuous upskilling in the liquid waterproofing market, as well as other roofing disciplines. Following completion of the BCP and application of the red CSCS card, many operatives simply do not register for the NVQ qualification. There are three ways to achieve an NVQ L2 dependent on experience – the Specialist Applied Skills Programme (SAP), Special Upskilling Programme (SUP) or Onsite Assessment & Training (OSAT). We’d like to thank those members who have contributed and helped the BCP to become as successful and effective as we have intended. 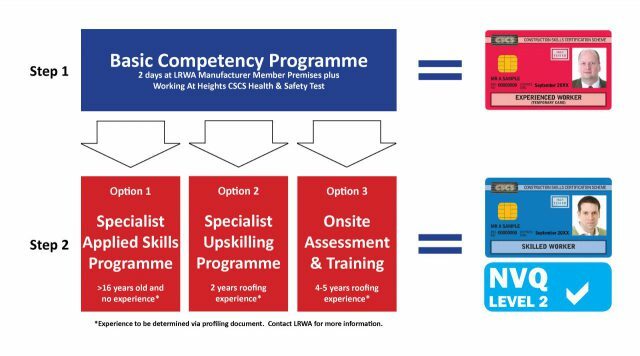 The next step is to encourage operatives to continue their training towards NVQ level, and we must all work together to help achieve this goal.